I mentioned earlier this month that I am working on various pumpkin recipes. 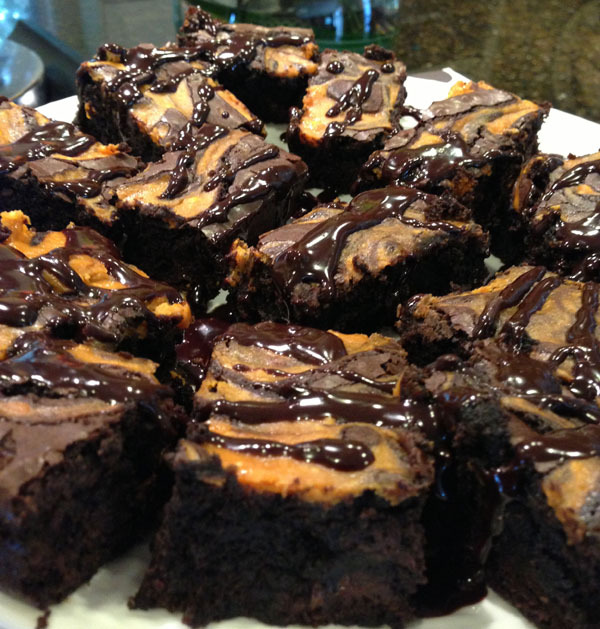 These chocolate pumpkin cheesecake brownies are delicious. It took me a time or two to get the recipe exactly right (thank you to my friends who were only too happy to taste test my various attempts to get this recipe down), but I finally did it. For extra richness I drizzle chocolate ganache over them when I am ready to serve. PS: This may look like a lot of steps, but it really is quite easy. Grease an eight inch brown pan and line it with parchment paper. Melt the butter and the dark chocolate pieces in a heatproof medium bowl set over a pan of simmering water. Stir until melted and smooth, remove the bowl from the heat and add the vanilla. Let cool for about 6 minutes. In a large bowl, mix together the cocoa powder, flour, baking powder and salt. Once the chocolate has cooled, whisk in the sugar and eggs and pour the entire chocolate batter into the bowl with the dry ingredients. In the bowl of an electric mixer fitted with a paddle attachment, whip the cream cheese until light and fluffy. Add the egg, sugar and pumpkin and mix again until the batter is smooth. Pour half of the brownie batter into the prepared pan and spread evenly. Drop dollops of the pumpkin batter (using a tablespoon) on top of the batter leaving one inch between each dollop. Pour remaining chocolate batter over the top and gently spread evenly. Drop spoonfuls of remaining pumpkin batter on top and swirl the batter gently using a butter knife. Bake the brownies in a 350 degree oven until a toothpick inserted into the center comes out very moist, but not wet (approximately 25 minutes). The brownies will continue to cook a bit while they cool. The Elegant Occasion Note: You do not want to overcook the brownies, so be sure to check them. Removing them from the oven while still moist and slightly undercooked will ensure a fudgy brownie. Let the brownies cool for 2 hours before cutting so the cheesecake filling can set completely. Store the brownies in an air-tight container in the refrigerator. In a heat proof bowl, microwave the heavy cream, chocolate and coffee in 30 second intervals, stirring at every interval until chocolate has melted. Drizzle on top of the brownies, or drizzle on individual plates and sit the brownie on top of the chocolate sauce.